So-called stainless steel casting process, simply to say, is the investment casting process making meltability model (referred to as “investment pattern or model) with fusible materials (such as wax material or plastic), coating the model surface with refractory coating in several layers, then form a whole shell after drying and hardening, melting the wax model using reoccupy steam from the shell model, and then put the shell in the sand box, filling sand in all round its modelling, next put into the furnace after high temperature roasting, finally pouring liquid stainless steel water into the shell for desired shape. Why Stainless Steel Casting? What are the Advantages? The size accuracy of stainless steel investment castings can generally reach CT4-6 level. Of course, due to the complexity of stainless steel casting process, there are lots of factors influencing the dimension accuracy of products, such as mold material shrinkage, deformation of wax model, deformation of shell in the process of heating and cooling, shrinkage of stainless steel, and the deformation of castings in the solidification process. So, although the size accuracy of stainless steel casting is high, it still need to improve the consistency (higher consistency if choosing medium and high temperature of the wax material). To improve the surface finish of stainless steel castings, casting moulds with good surface finish are required. In addition, the shell consists of high temperature resistant special mixture of the binder and refractory refractory coating coated on the shell surface, which direct cause high precision cavity. So, the surface finish of stainless steel casting is higher than water glass casting, general can reach Ra. 1.6 ~ 3.2μm. The biggest advantage of stainless steel casting is its high dimensional accuracy and surface finish, therefore it can reduce machining operation. Only leaving little machining allowance on areas that require machining. Most stainless steel castings only need to leave grinding, polishing allowance, no machining is needed. Therefore, stainless steel casting is the casting process that can save lots of processing time, and greatly save materials. Stainless steel castings can be used in a variety of applications where corrosion resistance is required at normal and elevated temperatures, along with reasonable strength, they offer good wear resistance and typical uses for impeller, valve components, sculpture parts, food processing industry (metal grinder parts), ect. CFS Foundry is the trusted investment casting foundry for stainless steel casting and machining service in China. We can manufacture custom stainless steel castings that match your exact design specifications. For parts ranging from a few ounces to 100 pounds or more, we provide tight tolerances and consistent part to part repeatability. 304 Stainless Steel, also known as CF8 or UNS J92600 , is the most widely specified grade of stainless steel casting. It is austenitic stainless steel with 18% chromium and 8% nickel. Type 304 stainless steel castings can be used in non-corrosive environments or corrosive environments at temperatures up to 800°F (426°C). Type 304 stainless steel castings have excellent low temperature properties and retain high impact strength levels at temperatures as low as -400°F (-240°C). 304 Stainless steel has higher chromium content and provide better compared to Type 316 stainless steels provides better high-temperature oxidation resistance. 304L Stainless Steel, also known as CF3 or UNS J92500, contain less than 0.03% carbon while 304 stainless steel contains less than 0.08% carbon. The less carbon content reduces susceptibility to intergranular corrosion in corrosive environments. So 304L stainless steel castings are suitable for some medical, industrial and chemical applications. 304L stainless steel castings are better than 304 stainless steel castings when the castings may require weld repair during services and post-weld heat treatment will not be performed. 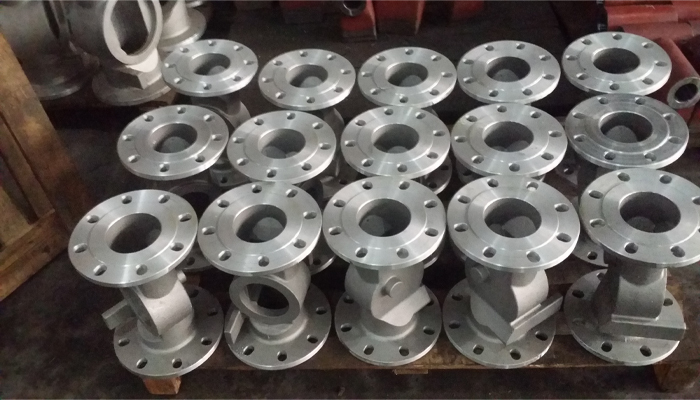 Type 304L stainless steel castings are generally used for service below 650°F (345°C). 316 Stainless Steel Castings, also know as CF8M and UNS J92900, are more resistant to corrosion than 304 stainless steel castings. Type 316 stainless steel is a modification of 304 stainless steel with 2.0-3.0% molybdenum added to improve pitting and crevice corrosion resistance in chloride containing environments. Combined with higher nickel content than 304 stainless steel, 316 stainless steel castings provide improved mechanical properties at higher temperatures. 316L Stainless Steel Casting (CF3M or UNS J92800) is the low carbon version of Type 316 stainless steel. For maximum corrosion resistance, Type 316L stainless steel castings should be heat treated. Similar to Type 304L stainless steel castings, post-weld heat treatment is not required because the alloy’s low carbon content limits formation of significant amounts of chromium carbide in the weld heat-affected zone. Type 316L stainless steel castings have good machining and welding characteristics. PH17-4 Stainless Steel, also know as CB-7Cu-1, UNS S17400, UNS J92200, UNS S17480 and. UNS W37410, is the most widely specified precipitation hardening stainless steel castings. Also called Type 630 stainless steel, 17-4 stainless steel castings maintain high strength up to operating temperatures of 600°F (316°C) and provide superior oxidation resistance compared to 410 stainless steel. 17-4 stainless steel castings possess corrosion resistance superior to the hardenable 400 series stainless steels and comparable to 304 stainless steel castings in most media. We can suggest the best stainless steel alloy that fits your stainless steel casting requirements using our silica sol casting method. Our professional custom solution can help you to produce your stainless steel castings in a cost-effective way. Any need for stainless steel casting and machining service in China? Pls contact us! Should We Use Investment Casting for The Next Project?